The next step for our Catholic wedding was to meet with a Deacon to discuss our ceremony. 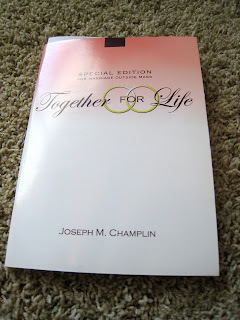 Jeff and I were given a book with all of our ceremony options, and we looked over it and picked our favorites before the meeting. 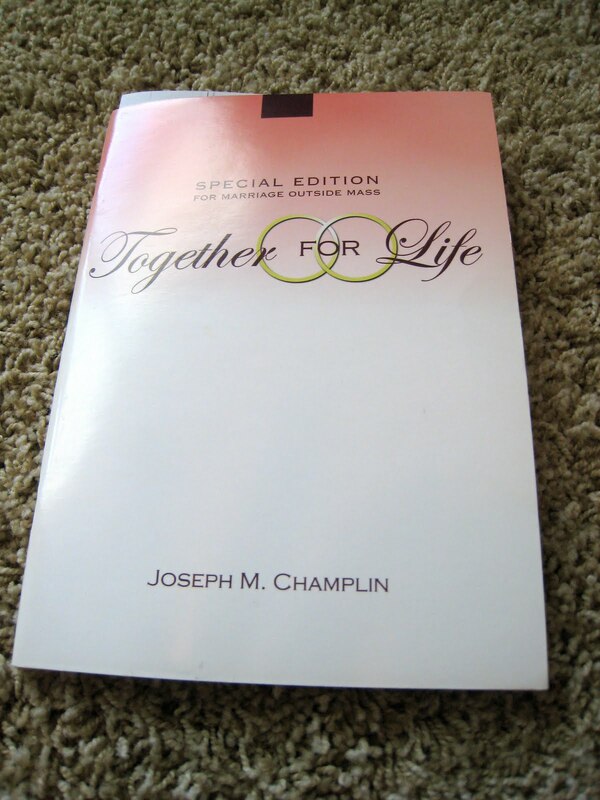 There are two separate books, one for the full wedding ceremony (including Communion), and one for the Liturgy of the Word only ceremony (no Communion). 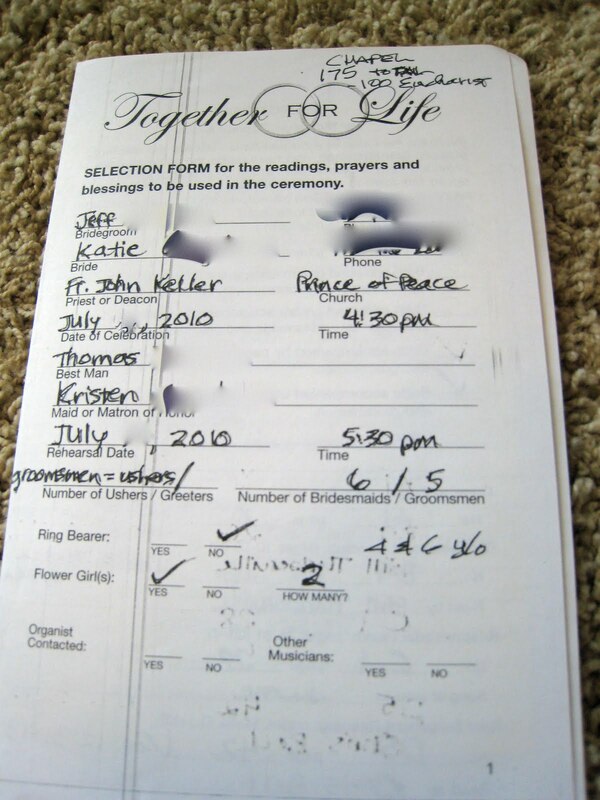 Both ceremonies are totally valid and sacramental, it just depends on which the couple wants. We opted to skip the Communion portion since none of Jeff's family is Catholic. We didn't want his half of the guest list to have to sit and watch and be bored while the other side of the Chapel went to take the Eucharist. 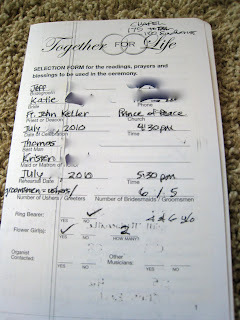 Inside the book, the options for each part of the ceremony are listed. 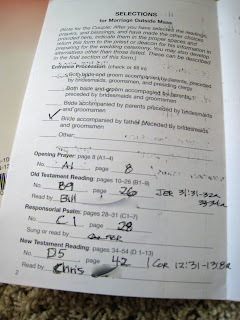 We had to pick one Old Testament reading, one New Testament reading, and one Gospel reading. 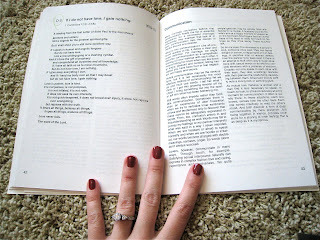 Each of the readings was in the book (left hand side) along with a description and explanation of its meaning in regards to marriage (right hand side). 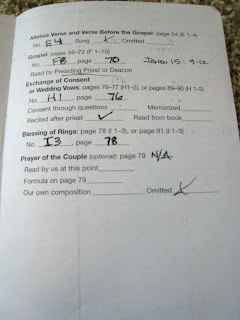 We also had to choose a Responsorial Psalm, and wording options for each of the Nuptial Rite parts. 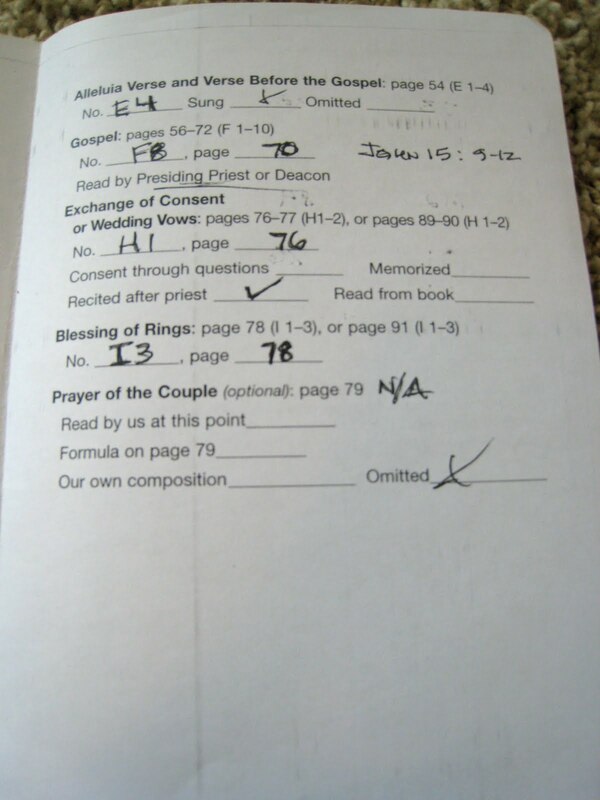 You get to pick the wording for the blessings, ring exchange, vows, etc. Contrary to popular belief, you can customize the Catholic wedding ceremony quite a bit. 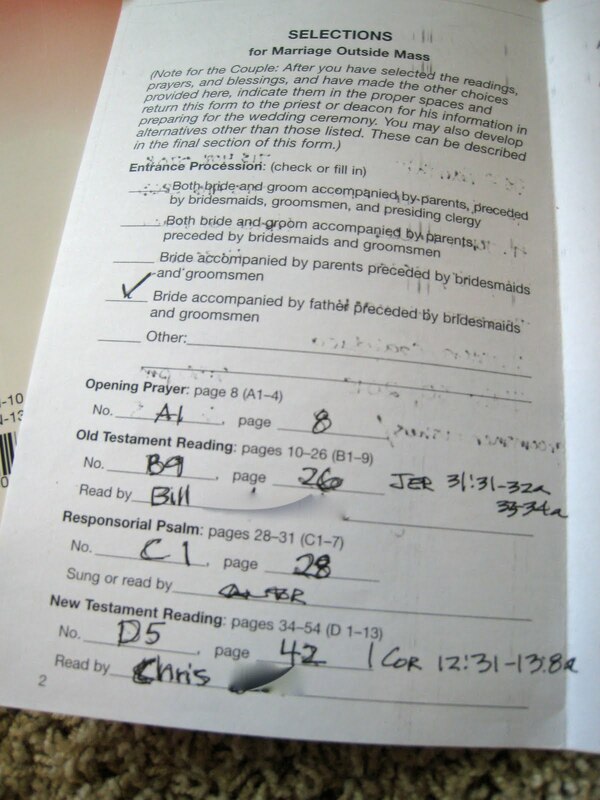 If you don't want to use the readings from the book, you can use any biblical readings you want, as long as they're approved by the Priest or Deacon. 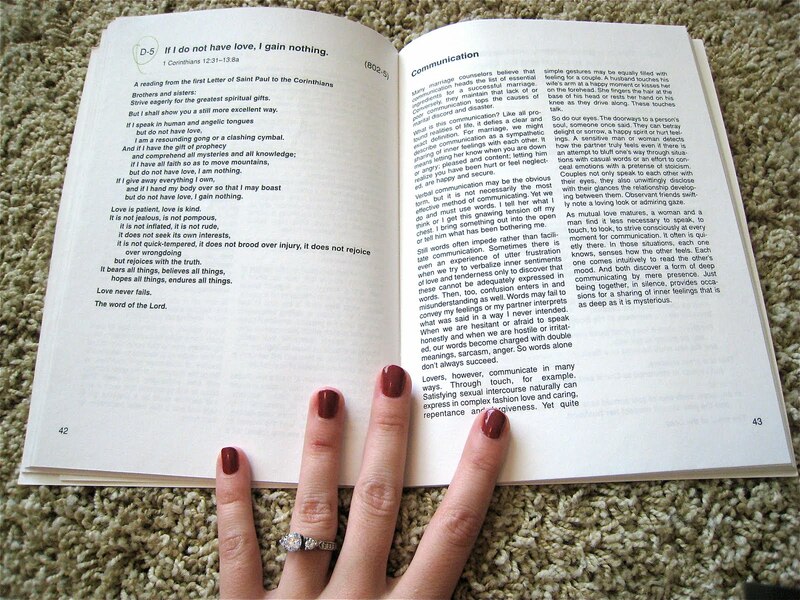 You can even write your own versions of the blessings and prayers if you want, or add in additional prayers that you've written. We added in a Unity Candle lighting, but people add on all sorts of things! I loved planning our ceremony. The ceremony is the most "real" part of the wedding for me, and it felt so exciting to finalize what we'll be saying when we receive the sacrament of marriage!